Our Systems are very easy to control! Frazier loudspeakers provide effective speech & music reproduction in a highly reverberant environment. Two CoLine CL1-36 provide unobtrusive and complete coverage of the entire worship space without energizing the room with reverberation. An independent sound system provides sound reinforcement of the choir from the loft, providing an acoustic imageof the choir and accompanyment that is sourced from the same location as the choir and organ. This is our first installation using our CoLine CL1. They were painted to match the stone columns. Notice that they blend in and are not easy to identify. 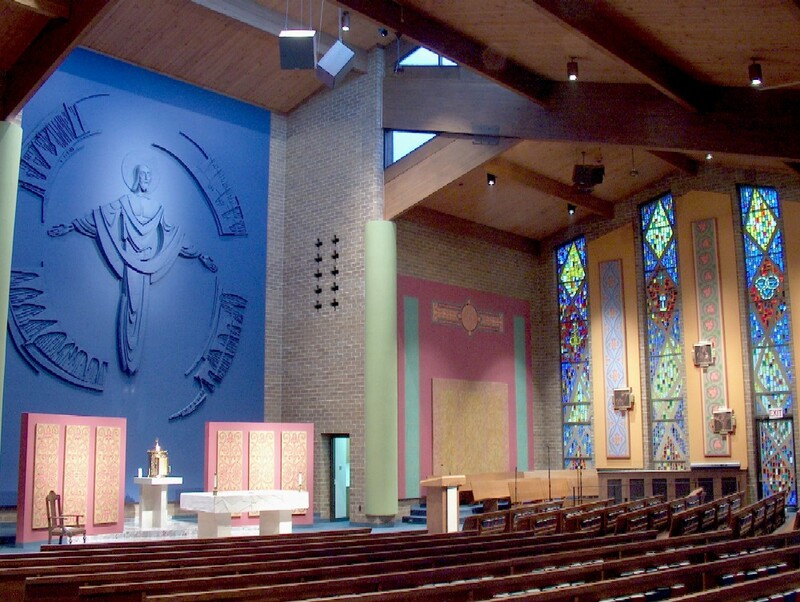 In 2006 CZ SOUND completed a complexx sound system for St. Benedict the Abbott Church. All of the speakers are concealed in the ceiling. 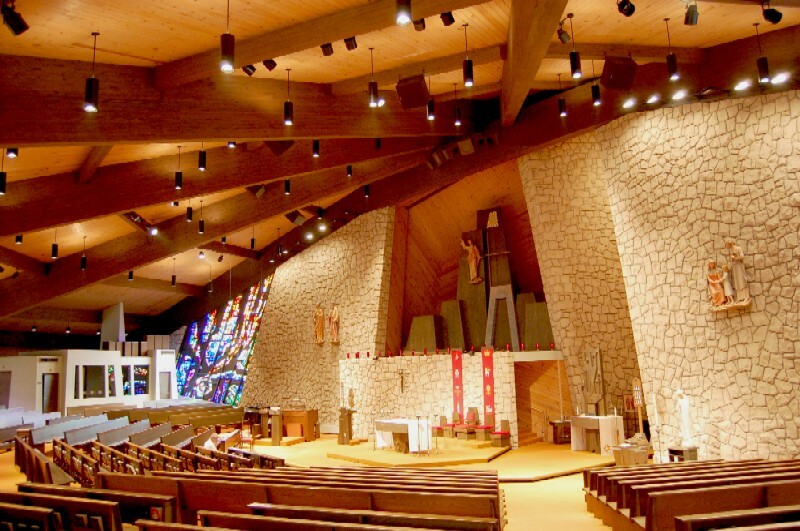 Frazier CAT66 & CAT69 2-way Coaxial/Coincident Loudspeakers privide even and clear sound reinforcement coverage of this beautiful church. After many years of struggling with a deficient Sound System, in July of 2007 CZ SOUND LLC installed a three hang JBL VRX line array speaker system, signal processing, power amplification and a Mackie TT System 32 Digital Mixing Console. Later Intelligent lighting and Very widescreen rear projection video was added to complete the package. This room presented some very unique challanges. Seating is 180 degrees and the loudspeakers were to be inconspicious as possible. The CoLines were painted to match the traditional color scheme and were mounted along each column behind the platform. Sound is even front to back and left to right. All seats hear equally well because of the true line array configuration of the CoLine Loudspeaker. The loudspeakers can be located behind the microphone without a feedback concern because the output energy is distributed along the entire length of the loudspeakers unlike conventional loudspeakers that are essentially a oint source. The best choice to have even sound in this highly reverberent space was to use two CoLine CL1-36 Loudspeakers. Even though all microphoners are in front of these loudspeakers there is more than adequate gain before feedback. This unusually shaped room presented tremendous challanges. The shape and construction materials created a space with very unusual reverberation. The only choice was to minimize loudspeaker to listener distance by installing two rings of ceiling mounted loudspeakers, Frazier CAT499's. 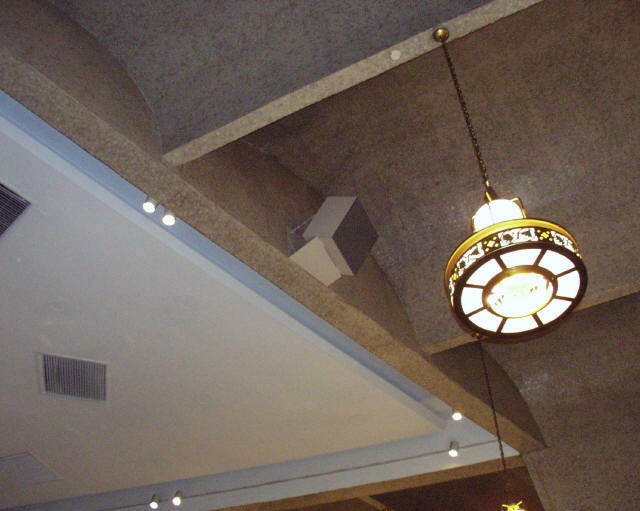 The "exploded cluster" Loudspeaker arrangement using two Frazier CAT69 Loudspeakers provides even and articulate front to rear coverage in a large and rather reverberent church. 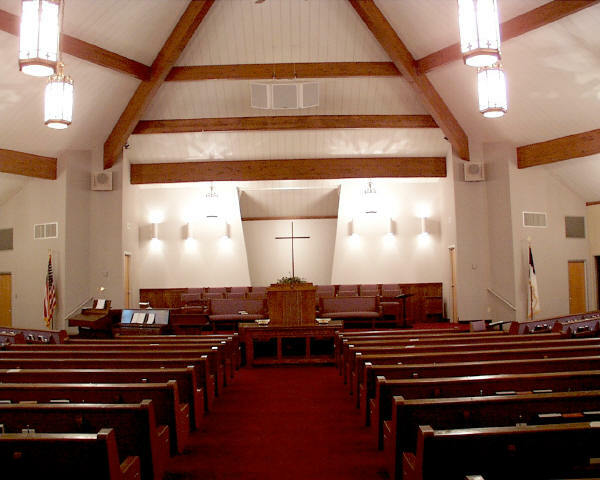 This church has two loudspeaker system locations. A central cluster for liturgy and a two element array for the choir. 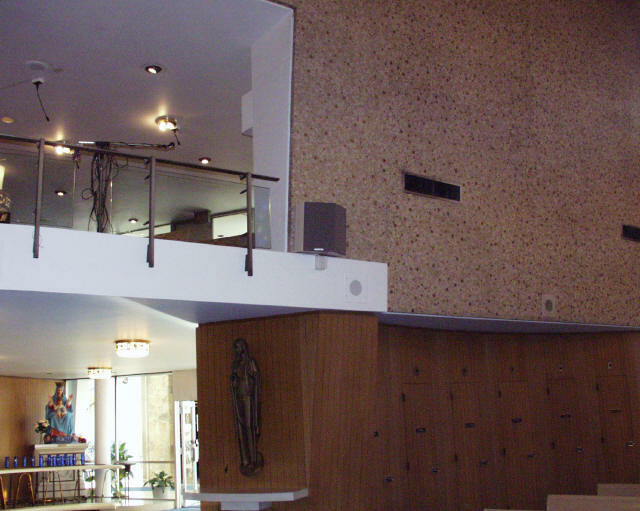 The seperate sound systems preserve the acoustic image of the choir originating at the front right of the church. All signal processing is done in one Lectrosonics DM1612 Digital Matrix AutoMixer with DSP.